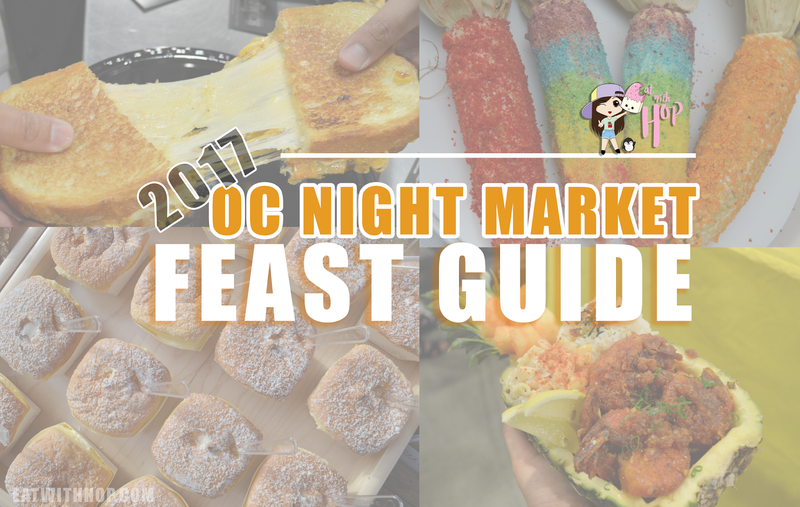 Your 2017 OC Night Market Feast Guide - EAT WITH HOP! The long awaited OC Night Market is back with more great eats and new twists! This year, I had the pleasure of attending the OC Night Market media preview and got to exclusively sample vendors that will be at the OC Night Market! These, of course, aren't the only vendors that will be selling at the night market, because there will be many many so many more vendors! These are some of the vendors that came to promote their offerings! LET'S CHECK OUT SOME OF THE EATS! Y'ALL READY?!? Baked Dessert Bar has some really yummy cupcakes! I got to try a few mini cupcakes as samples but what they will actually be selling at the night market are the jar cakes! I brought the "neopolitan" pandan + ube jar cake to my friend and she said it was one of the best she's ever had! TAKE ONE OF THESE JARS HOME THIS SUMMER FROM THE OC NIGHT MARKET! JJ2 BAKERY (from Alhambra) will also be there with some dessert and even Philly cheesesteak! My fave from JJ2 BAKERY has to be the Hokkaido Cup Cake! It is light and fluffy sort of like a sponge cake but has a fluffy hokkaido cream inside that tastes fresh and not too sweet! It wasn't tiring to eat this since overall it's not overly sweet. Just the perfect proportions! JJ2 Bakery also offers their Green Tea Sponge Cake that looks like a watermelon! I couldn't taste too much of the "green tea" part but overall it is a subtly sweet and IG-worthy sponge cake (since it looks like a watermelon!). They also have Philly Cheesesteaks! I didn't get to taste any of this actually (was in a rush for a bday dinner) but if they are selling the same size for the night market, then it's quite small in my opinion. I wonder how much they will sell it for? Also, I think it's sort of a regular item to sell at the night market. You know what I mean? Maybe it needs some rainbow cheese or something [jk though] but I feel like you can get Philly cheesesteaks at a restaurant nearby and it would be solid. I feel bad for judging it this way without even trying it but you know, everyone has to make a judgement when they are faced with so many decisions at the night market with only so much in their wallet. You gotta think... what's worth? I'm sure y'all all think this ... amiright?! I don't know about you, but I usually go to these night markets to try out-of-this-world and maybe weird or "Instagram-worthy" food that isn't available anywhere else (or hard to find). Overall, if you plan to stop by the JJ2 BAKERY booth, GO TRY THEIR HOKKAIDO CAKE! It's unique and delicious and stood our the most to me! DONUT DYNASTY! Oh... yessssssss!! I want to be the ruler of this dynasty, because I LOVEEEE CHINESE DONUTS! *Note: I've seen other types of food called "Chinese Donut" which is called "Banh Tieu" in Viet (that fried puff with sesame seeds) so I think it may be confusing a bit ?? To call so many things a Chinese Donut ?!? I usually eat Chinese Donuts a.k.a. Dau Chao Quay (Vietnamese) with porridge and it's so good! I love how it's oily and crispy and gets a bit soggy in the porridge. They have several flavors too for the Chinese donut dessert ! so I just had to try this ! Cuz... MATCHA! Anyway, it's pretty good and the matcha is more of a milky matcha and was still yummy! The Liams Lemonade booth will be selling these ELOTES covered in chips! GET DRUNK WITH CAKE! For all you alcoholics... this is the spot for you! Okay okay, the vendor told me no one can actually get drunk off of their cake pops, but your breath will smell like you drank alcohol! DRUNKEN CAKE POPS invites y'all to #eatresponsibly haha. Okay, to be honest, I didn't try these but gave it to my friend (remember that bday dinner I mentioned earlier?). She said it was good but anyway, I don't drink alcohol anyway so I can't really judge. The light and bubbly taste of pink champagne infused into a light vanilla cake. Perfect for any special occasion! R.T.E. BBQ, which recently opened at the Mission Viejo Kaleidoscope, will be joining the OC Night Market for the first time. They will be serving some fresh skewers of lamb, beef and more! SLIDE, will be selling... sliders?!! This is probably why they call themselves..sliiiiiide. Haha. This seems like one of the more worth it vendors! Why? They have interesting stuff like FRIED SOFT SHELL CRAB in a STEAMED BAO BUN! Omgah. THE NAUGHTY CHURRO is also back. They are famous for their poop emoji churros and churro chicken sandwich! At the media tasting event, they were giving MINI churro chicken sandwiches that were oh so cuuuuuuuute!! Ah!!! I wish I got a clearer photo of it! So I actually have had this before at the OC Night Market last year in 2016. It looked so good on the `gram but I was a bit underwhelmed. Kevin and I had it on our list to try because we love churros anything! The amount you get is a generous portion for around $10 and I recommend it to be shared between 2 people. The downsides to this was that it's hard to eat it as an actual sandwich and the churro itself isn't very "churro"-like. The churro is more like a soft airy bread dipped in cinnamon sugar. But once you let go of expecting "churro"-ness out of this, the overall thing does taste pretty good! Samys Smoked Tacos will be serving up smoked tacos and smoked pull pork tamales! I am excited for the tamales! *Note: I also didn't try this but it all looked so good! It's basically smoked meat in tacos! YUMM! AN CHOI CO, a food truck, will be serving their baguette sandwiches (banh mi) and wings! The KBBQ Chicken Banh Mi and Little Cheesesteak Banh Mi looks delicious! I would probably go for the Cheesesteak one! The truck also sells some drool-worthy looking Little Saigon Cheesesteak Fries, so I hope they will bring that to the OC Night Market too! If I remember correctly... the owner is half Mexican and half Vietnamese, so he is bringing the fusion of flavors together to this event! An Choi Co will also feature their East Asian chicken wings featuring three flavors from Japan, Korea and Vietnam. They come with a fresh papaya salad and a pair of finger naps to keep your hands clean! RAMEN GRILLED CHEESE SANDWICH? You read that right. The Sandwich Society is doing something quite innovative and different! The EXCLUSIVE OC NIGHT MARKET sandwich they will be selling is the RAMEN GRILLED CHEESE SANDWICH with jalapeños, corn, kimchi and special house sauces! Note: It totally reminds me of the spaghetti grilled cheese from Burnt Crumbs but with korean style with ramen + kimchi ! Because Koreans (as do I) love putting them slices of cheese into their bowl of ramen (Korean word is ramyun though ...?!) !! Shrimp Daddy has a unique Hawaiian dish! They are always at the Los Angeles Smorgasburg every Sunday if you happen to miss out on their booth at the OC Night Market, but for all those too lazy to drive from OC to LA, add this onto your list! Feed yo`self this delicious HAWAIIAN GARLIC BUTTER SHRIMP ! Comes with a pineapple too! The pieces of shrimp are huge and you get around 4 to 5. The li-hing powder on the pineapple has a distinctive plum flavor which is sorta sour and sweet and salty! This also comes with Hawaiian Macaroni Salad and rice with Furikake. 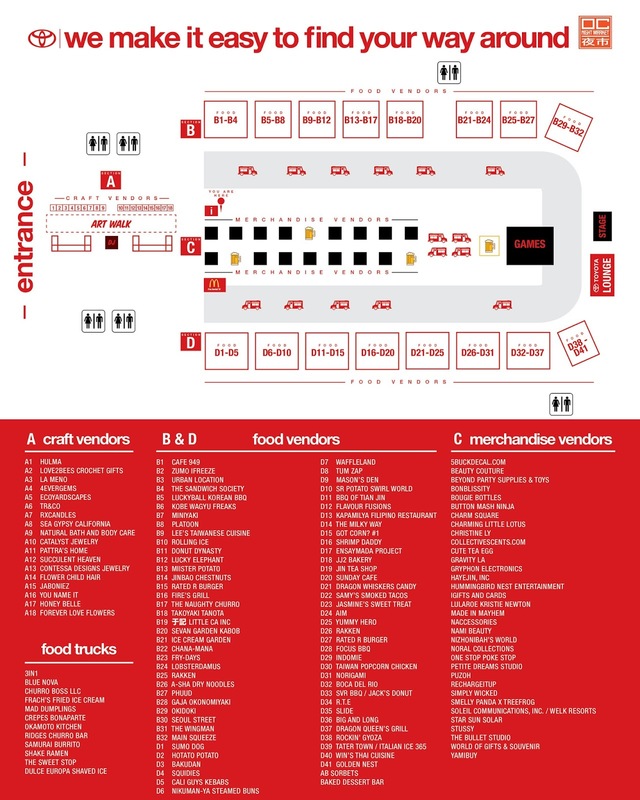 There are many other vendors that weren't at the media preview, but will be at the OC Night Market! Make sure to come out to play and try out the other vendors! I will also be posting a recap blog post of my experience the same weekend with (hopefully) a complete list of vendors + prices! So, look forward to that, Taste Buds! most vendors do not accept credit card. I made this mistake last year.... so don't be like me and BRING CASH!! bring a backpack or bag or something to hold your stuff and potential freebies! share the food! Why? So you can try as many different things as possible with as much tummy space possible! So bring yo friends! check #OCNMDeals for more specials and discounts on event days! Arrive early to beat the dinner rush from 7pm - 9pm! If you're not a foodie, go for the events! 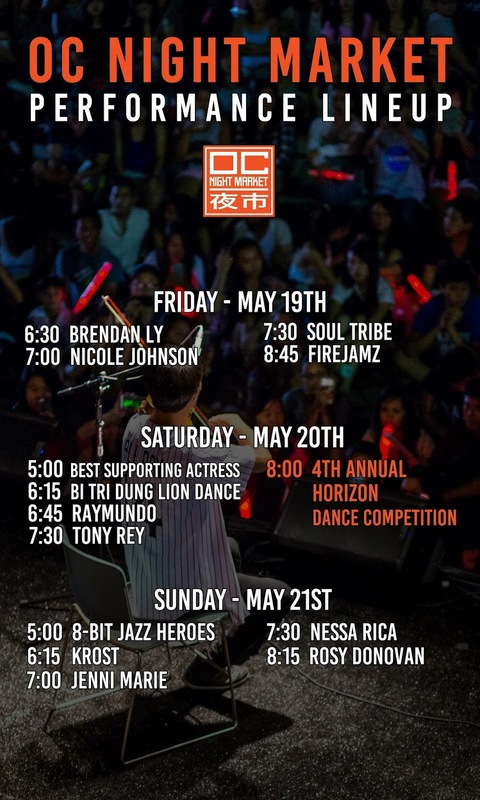 I love how the OC Night Market tries to bring in celebrities and talents so that there is more than just food! There are also vendors that sell art and clothes and more! One time, I came here specifically for a performance by Che`nelle which is a famous singer in Japan! $5 cash at the door only. Children ages 6 and under free. STAY CONNECTED WITH EAT WITH HOP!